She then demanded that police take her to the hospital because of a shoulder injury she had previously suffered. When physicians could find nothing wrong, the officers took her to the police station. 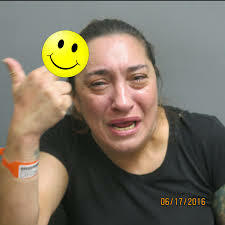 She allegedly refused to cooperate during booking, spitting at them and making an obscene gesture when police took her mugshot. None of it did her any good; police charged her with DUI, driving under the posted speed limit, illegal lane usage and driving under the influence of drugs. (Rojas apparently had diazepam in her possession when police picked her up). Under California Vehicle Code 23152 (e), driving under the influence of drugs in California (DUID) carries the same penalties as DUI: probation for three to five years, fines and court costs, loss of driver’s license and a possible jail sentence.